The aluminium chasis makes it light just 12.9 kgs with extra load capability of 5kgs. Summit has dual mode autonomous navigation as well as remote control and the onboard Pan Tilt Zoom (PTZ) gimbal camera transmits video in real time. 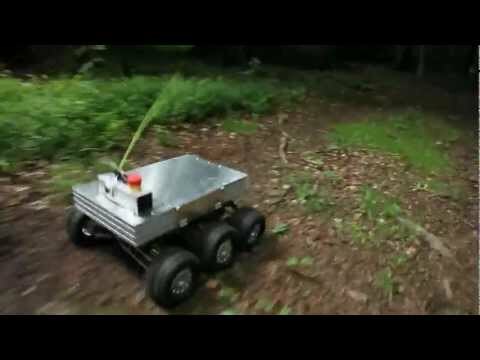 This makes this robot ideal for operations involving the monitoring of some hazardous environment or for security purposes where human presence can be dangerous. The payload of laser range finder, RTK-DGPS and IMUs are fully fused together using latest algorithm to provide autonomous navigation and precision location of the robot.